So I’ve had my ear to the ground, well, and to the laptop as it were, and I’m hearing A LOT of conversations about food – real food, healthier food, making changes, and the thing I’m hearing most is folks saying they need to EAT MORE VEGGIES (cue angel choir singing here). So many wonderful conversations, and it’s so exciting to see/hear that folks are really trying to find some lasting change. The rest of that conversation, however, is full of questions and frustration. What should I cook? What if they don’t like it? I can’t seem to find a way to prepare these things that anyone enjoys…. This IS where the rubber meets the road, isn’t it. All of our good intentions are for naught if the food doesn’t follow. Today’s post is my attempt to give a little basic training on two of my favorite veggies in an attempt to help you find some ways to enjoy them. Then I’ll show you how I ate them together in the same bowl…. I know, the suspense is killing you. If you’re trying to introduce a vegetable and you really want to get some nutritional mileage out of that challenge, I say go for it – go all the way and deal with the queen mother of veggies – broccoli. Broccoli is so stinking good for you it’s almost silly. It is also, um, blessed with a rather unpleasant odor and a little bitterness that a lot of folks, most especially little people, find a little difficult to swallow. There’s plenty of advice out there on how to get the broccoli in – cover it with cheese, dunk it in ketchup, batter it and fry it – but all of these methods miss the mark by hiding the problem rather than addressing it up front and allowing us all to learn to enjoy the darned thing on its own merit. This OXO Good Grips Pro Swivel Peeler is a great one for broccoli stems and other tough customers. 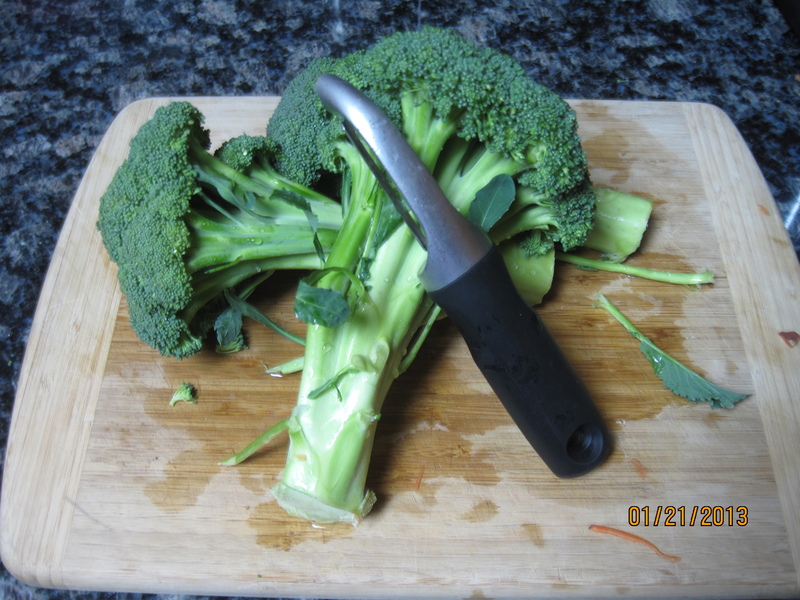 I am now going to share the great broccoli secret with you… peel it. Yes, I said peel it. Buy it fresh, and use a peeler on the stalks, going as high up as you can without it becoming awkward or dangerous. Off goes the peel, away goes a WHOLE lot of that bitter, and some unpleasant texture to boot. Cut off the hard end. Slice the stalk into large coins up to the floret and then separate the floret into whatever you think passes for a manageable size for your crew. At this point you could do a variety of things. We have roasted it, following this procedure and replacing the parm with nutritional yeast flakes (“nootch” for those who find the yeast flakes title unappetizing). We’ve grilled it thanks to our wonderful friend at Emmy Cooks. Most often, we simply steam the little suckers (using a simple steamer basket in a pot) and then flavor them with the rest of the meal. When peeled, steamed broccoli is slightly sweet and delicious. My son prefers his with a little olive oil. Truthfully my son prefers everything with a little olive oil. Why sweet potatoes, you might be wondering? Well, I hear that folks eat an awful lot of spuds, like an enormous amount of potatoes (and honestly, I can’t blame anyone for this as I am a spud fan myself). Potatoes are better than a lot of choices one could make for eating, but sweet potatoes offer a range of nutrients that aren’t in regular potatoes. They are also versatile, and so very good looking. If your encounters with sweet potatoes have been limited to baking pans with the delectable spuds acting as a base for marshmallows and brown sugar, I’d like you to know there is a whole sweet potato world out there that is a little less like dessert, and is warm, hearty and delicious. My favorite recent preparation for these tubers was inspired by Alice Waters’ Sweet Potatoes with Lime and Cilantro (in Chez Panisse Vegetables). Because I am lazy I did not follow her directions, but instead roasted my spuds – cutting them (washed but unpeeled) into roughly 1 inch pieces, tossing lightly with olive oil and a little salt, roasting on parchment paper on a baking sheet in an oven at 450 degrees for about 20 minutes, stirring once to turn the pieces about halfway through. When the sweet potato pieces were brown on the outside and tender on the inside, I sprinkled with fresh lime juice and chopped fresh cilantro. Unbelievably yummy. So if you’ve been playing along, you have two beautifully cooked veggies ready, and that’s about it. You could serve these as a side with just about anything – or you could make them more of the main event. 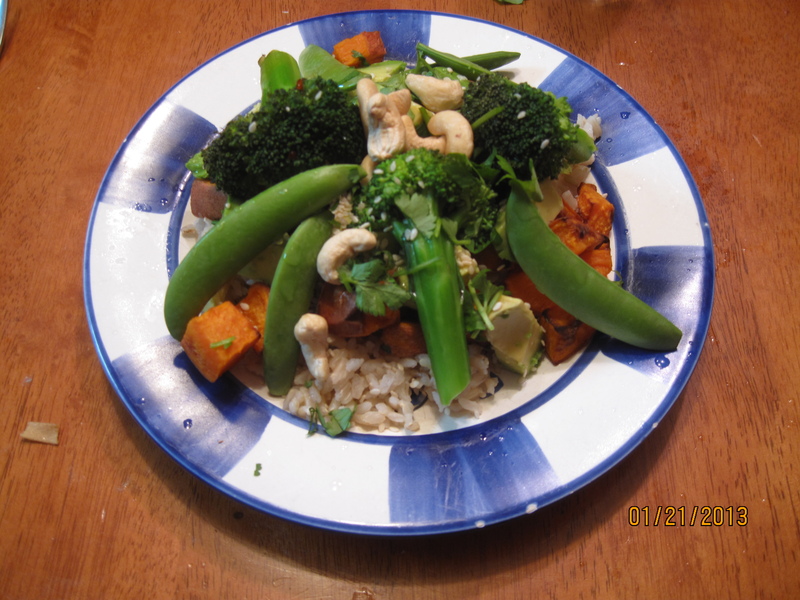 When I prepared these beauties, I served them together, varia-bowl style. I warmed leftover rice and put out some raw veggies (snap peas, chopped cucumbers), some soy sauce, with ginger and garlic in it, some cashews and sesame seeds. I tend to pile everything up. My children like to keep separate sections of all of the offerings – and they eat that broccoli, because like the rest of the meal, it is delish. More broccoli goodness from the pantry: bok choy, ginger, and broccoli; broccoli with Asian peanut sauce; or try broccoli with raw pad thai sauce. More sweet potato gems: exotic barley breakfast or try swapping sweet potato for pumpkin in these gluten free pump-king pancakes. I just ate leftover roasted sweet potato “fries” with baba ganouj for breakfast. I’ll take any excuse to eat sweet potatoes! Great tip on peeling the broccoli stalks – it does make it much more appealing to those who are not in love with this (great!) veggie! I’ve always liked broccoli, but can admit that I like it better this way too. 🙂 Thanks so much for stopping by! Hmmm…maybe I am more adapted in taste, but broccoli only smells/tastes strong to me when over cooked. Otherwise I find it sweet in taste 🙂 I like it barely steamed, till just fork tender and still bright green. A drizzle of olive oil and a pinch of sea salt and I could eat a pound by myself…..
Hi Rosilind! I’ve heard of white sweet potatoes, but have never seen them here – must be a regional thing. I’ll bet you could get a similar result by using carrots. Thanks so much for stopping by! Great tip Little Sis! I have been peeling my broccoli stems for years and always thought the stems were the sweetest part. Plus you get some very interesting shapes sometimes when you slice them. It’s such a little thing, but makes a HUGE difference for the pint sized broccoli detractors in my house. Excellent Post! I have to start doing more with Barley – other than just soups. ALWAYS looking for more Broccoli Ideas, thanks! Great post! I didn’t realize that peeling the stem would help, though I don’t mind the taste of broccoli. My kids were chowing down on it last night in the Chicken Chow dh made for dinner. Actually a bit funny to watch. Good times! Thanks for sharing your tips at Motivation Monday! You guys are awesomesauce! Thanks Barb! We think you’re pretty awesomesauce too! It’s refreshing to hear that my little ones aren’t the only picky ones out there. While I can still get my 1-year old to try almost everything (especially, if she sees it on someone else’s plate), it’s my 4-year old that needs more persuading! Surprisingly, I can get him to eat broccoli easier than I can sweet potatoes now (at least with full disclosure). And I admit disguising veggies still. I will absolutely NOT judge you for disguising veggies. I slip them into things all the time, just to get one more in without controversy. Mine were a lot more adventurous and willing early on… They’ll still get there eventually, but some nights it’s definitely a waiting game. Thanks so much for stopping by! I love my veggies. I think that’s cuz I grew up eating them (fresh from the garden in the summertime, frozen/canned from the garden in the wintertime). I imagine you’re right and that’s the reason. I wish I could say the same. While I got some fresh, most were frozen (not terrible) and many were store-canned and cooked until limp. Well, I *was* smiling about the Dana Carvey comment…until I realized I’m no longer a “young reader”. lol! Broccoli is on our “to grow” list, which means it’s going to be on our “learn how to eat it” list, too. Only my daughter and I will eat it now, so I rarely buy it. Thanks for the tips on making it edible! haha!! No worries, just a little joke. I am really hoping that the kids being involved in the growing will inspire them to want to try it. My favorite way to eat broccoli is steamed with a little bragg’s liquid aminos. Can’t go wrong! Thanks for the good information. I didn’t know to peel the stalks of broccoli. Our pleasure Lori. It’s a lot tastier that way. Let us know if you give it a try! Great posts! I do think that a lot of times the basics are overlooked and there are plenty of people out there needing advice on the simple stuff! Your post is great and thank you so much for sharing it with Full Plate Thursday. I peel and use broccoli stalks all the time to get the most out of my purchase!! Thanks for this post! I’ve never been a big fan of broccoli, but I will have to try the peeling tip. Maybe it will change my mind! I’ve changed many minds with a peeler, Sara – maybe your too. 😉 We’ll check out the link! Thanks for the invite! We love veggies in our house, and I was lucky that my son loved them growing up as well. We always called broccoli, ‘trees’, when he was little, and he got a huge kick out of eating them with this fingers. You’ve got some great ideas in this post. Dana Carvey is wonderful and here’s hoping you can find a way to enjoy the broccoli you chop. 😉 Thanks so much for stopping by! Thanks for linking up at my Pin Me Linky Party. This looks great! Thanks for linking up at Gluten Free Fridays. I have it pinned! Thank you for hosting and pinning! Hi, I am over from Allergy Free Alaska. I also have a challenge to have everyone eat more vegetables. For broccoli, not only peel the stem, but matchstick it, or grate it in the food processor, and make a broccoli coleslaw, with cabbage, and carrot. We use lemon juice and oil with salt and pepper and a hint of sweetener, all to taste and let it marinate in the fridge for at least an hour and it mellows the flavors. It is not as pungent as a vinegar and oil. If you use red cabbage shredded too, the effect is very pretty. 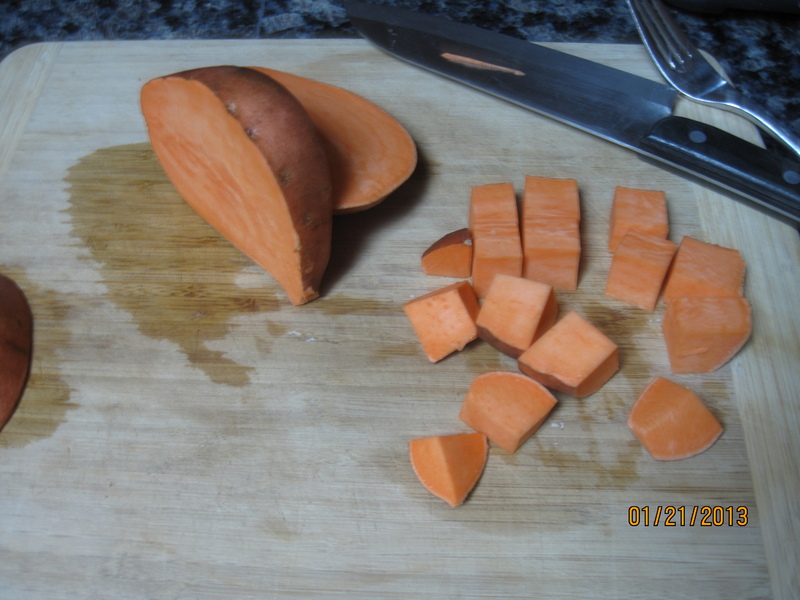 Sweet potatoes that have garam masala as a flavoring are also delicious when sprinkled and roasted or stir fried. I will try the lime juice and cilantro. I sounds delicious. We are on a Thai kick and I imagine coconut milk with the lime and cilantro would also be good. Oooh, that slaw sounds great! And the garam masala on the sweet potatoes is a must try – thanks so much! We just love veggies and this looks like a great combination! Thank you so much for sharing with Full Plate Thursday and have a fun weekend! Hi! I am stopping by from the gathering spot and just wanted to say a quick hello and pin this great information. Thanks so much for sharing it! Thanks for stopping by Rena – and for the pin! Thanks for the broccoli tips. I’ve been cutting off the stack and throwing them into my veggie stock scrap bag. Next time I’ll try your trick and peel them and cut them into coins. I also agree about sweet potatoes. They are so good and I’m surprised more people don’t make them other than the Thanksgiving casserole or baked. So many ways to make these guys.